I'm going through a phase where I'm questioning everything I do. In tandem, I want - and sometimes feel that I need - answers. Most of the time I can't get those answers - they're hidden in the future or are choices I need to make - but I realised recently that I do have a way to find out what you think of a few blog-related questions: a survey. There are only ten questions, eight of which are multiple choice, so it shouldn't take too much time. None of the questions are compulsory and the survey is anonymous. The survey has now closed. Thank you so much for your responses! I hope you enjoy doing the survey - I'm certainly looking forward to seeing the results and playing with the statistics (on that note, have you seen these awesome graphs you can create from the incidence of words and phrases in the digitized archive of Google Books? I obviously entered 'butter', 'biscuit' and 'cake' - I find the peaks in 'butter' and 'cake' around the two world wars fascinating). I couldn't think of any sensible photos to use for this post so I've gone for a series entitled 'holding my camera where I can't see into it: inadvertent self portraits'. And yes, I was wearing my pyjamas when I made the éclairs. Every time I make this bread, two memories pop up. The first time I tested this idea, I was listening to the radio online. Someone had linked to the programs - I think on twitter - and I'd clicked though, curious. As they describe, "We spent five months at Harper High School in Chicago, where last year alone 29 current and recent students were shot. 29. We went to get a sense of what it means to live in the midst of all this gun violence, how teens and adults navigate a world of funerals and Homecoming dances." It's split into two halves: Part One and Part Two. Guns and gun crime weren't even on my radar as a child or teenager. I know nothing else about the show but the programs have stayed with me. It's not just the words or their lives that have stayed with me, but the way I felt, listening quietly as I wove the dough together. It's as if I entwined my heavy heart into the recipe and I can't disentangle the strands. Then, before I went out to Switzerland a few weeks ago, a few of my friends came to stay to celebrate a friend's birthday. I'd made the bread a few times in the weeks after listening to the radio and I wove it together again, taking the series you see below, the morning everyone was arriving. I ran out of time to bake it and had to throw it into the fridge to rise overnight. We ate it for breakfast the next day, hacking off slice after slice as we drank our tea and chatted. I miss having lots of good friends in Oxford. All but one of my friends from university have moved away and are spread out over the UK. I miss the community of university, even though I know it wasn't as rosy as my memory tells me. It was so good to spend that weekend talking for hour after hour after hour - to get past catching up on the basics of our new lives and onto other stories, onto childhood memories and new questions. So now the bread is infused with two very different - but both strong, both emotionally evocative - memories. Roll up from the long side / Cut carefully into two / Weave the strands together, cut side up / Pull round into a circle, weave the ends together and seal. 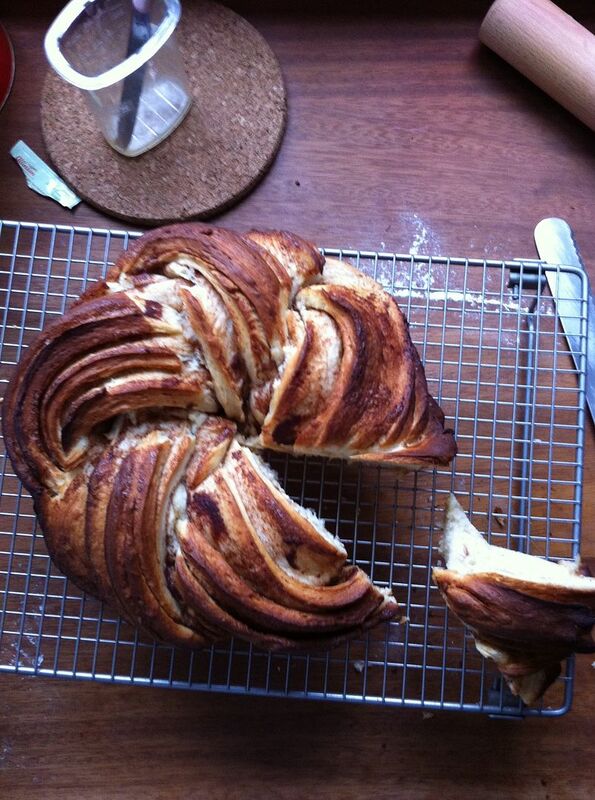 This recipe started with Ottolenghi's Chocolate Pecan Krantz Cake. As I mentioned in that post, I wanted to try a cinnamon roll version using the shaping technique but changing the recipe. When I got around to making it, I added cardamon and I decided to try and loop it around into a circle. My main problem was trying to get the baking right - the first time I underbaked the loaf and I slightly burnt the edges twice. In the end I settled on a high starting temperature then a decrease for the rest of the baking time, which seems to work well. After making a few versions, I saw a very similar idea on Pinterest and discovered that the loaf has a name and a history. It's called a kringel and it comes from Estonia. I first saw the pictures from this post, which I followed to this one. Every time I make it, it looks a bit different - here's a blurry picture of my first loaf. The other reason the two photos above look a bit different is that I was experimenting with spelt flour. Both of the times I tried spelt, the dough was wetter and didn't rise as much. I think I prefer the texture of the loaf made from normal bread flour, though that might just be because it's what I'm used to. The photo below shows a slice of both loaves - the spelt is on the bottom (the normal one is only part of a slice). I might fiddle a bit more with the spelt version - I do quite like the flavour. This bread has become one of my favourite breakfasts. I particularly like it toasted with some salted butter. Sometimes I even add a slather of jam (my favourite is raspberry and redcurrant) or marmalade. The past few weeks have been a bit rough and I know a few things have been a bit erratic (especially replying to emails and posting on time). Hopefully things will calm down now I'm back in Oxford and I'll get back into a rhythm. Update: I've written about this recipe for Food 52 and after re-testing it, I've updated the recipe below too. I've combined the butter & cinnamon sugar for the filling so the layers of the roll stick together - it makes the shaping easier (as you can see below - the full set of new photos is on Food 52). Take the butter out of the fridge for the filling to let it soften. Put the milk and butter for the dough into a small pan and heat over medium until the butter has melted, then turn up and scald (bring just up to the boil). Pour into a bowl and pop into the fridge to cool (this can take some time). Crush the cardamon pods with the side of a knife and remove the seeds, then finely grind the seeds. Combine the flour, sugar, salt, cardamon in a mixer bowl and stir, then add the yeast and stir again. Beat the egg up lightly in a bowl. Once the milk has cooled to body temperature, add it and the egg to the bowl. Stir until you have a shaggy dough then put on the machine and knead with the dough hook for 4-5 minutes until the dough comes away from the sides and passes the windowpane test. Cover the bowl with cling film and leave to rise for about 45 - 75 minutes until the dough has doubled in size (you could also do this rise overnight). Turn the dough out onto a lightly floured surface then roll out into a rectangle of 30 x 40cm (12" x 16"). Beat the soft butter, sugar, cinnamon and salt together. Spread the mixture over the entire surface of the dough. Roll up from the long side, then use a serrated knife to split the roll lengthways (it doesn't fall apart as much as the pictures - I was trying a different filling technique). Transfer to a sheet of baking parchment (I forgot to do this during the photo series above - if you do too, just carefully lift it onto the paper later). Weave the two strands together with the cut side up. Bring the ends together then press together to make a ring. Cover with cling film and leave to rise for about 30 minutes until puffy (if you press it with a finger, it should make a dent). You can also place into the fridge overnight to rise slowly - take out to warm up ten minutes before baking. While it rises, preheat the oven to 180C/350F. Use the parchment to shift the ring onto a tray. Put into the oven and bake for ten minutes, then reduce the temperature to 160C/320F. Bake for 25-35 minutes until the ring is risen, deep brown and sounds hollow when knocked. Remove to a wire rack to cool. Keeps fresh for a day, toasts for a few days, freezes well. UPDATE 30/11/17: Just adjusted the baking time range as mine baked a bit faster. "I cut and handed the sweet seed-cake - the little sisters had a bird-like fondness for picking up seeds and pecking at sugar; Miss Lavinia looked on with benignant patronage, as if our happy love were all her work; and we were perfectly contented with ourselves and one another." David Copperfield, Charles Dickens, Chapter 42, 'Mischief', published 1850. Since coming across this tender scene while reading in preparation for my first term at university, I've found seed cake in several other books and always wanted to try it. As I was already on a history kick with my Hot Cross Buns and Lemon Posset, I decided to see what I could find. an ende of wheat sowing we make for this yeare. the Seede Cake, the Pasties, and Furmentie pot." The feast to celebrate the end of sowing fell on St Martin's Day, the 11th of November. Originally, the forty day fast for advent started the next day, so it would have been an occasion to use up and enjoy rich and special foods (just like Pancake Day before Lent). Over time this association with St Martin's Day seems to have faded and seed cakes became popular all year round. But what is a seed cake? Nicola Humble notes in her book on the history of Cake that the following recipe from 1631 is the earliest recorded for a no-yeast sponge-style cake. It also contains aniseeds and coriander seeds. I've transcribed this from digital images of the edition I found through the Bod, preserving the spelling and capitalisation, though not the long s and other typography (I'd have loved to show you the images but the permissions were a bit complex). "To make Bisket-bread, take a pound of fine flower & a pound of sugar finely beaten and fearfed, and mixe them together; Then take eight egges and put foure yolks and beate them very well together; then throw in your flower and sug it as you are beating of it, by a little at once, it will take very neere an houres beating then take halfe an ounce of Aniseedes and Coriander seeds and let them be dried and rubbed very cleane, and put them in; then rub your Bisket pans with cold sweet butter as thin as you can, and so put it in and bake it in an oven." From The English House-wifes, Gervase Markham, 3rd edition, printed in London in 1631, p.125-6. The recipe continues on to describe how to make thin cakes with the same mixture, which, interestingly, are then called 'Cakes' instead of 'Bisket-bread'. It's also noteworthy that most of the beating takes place after the flour has been added - I imagine it would make a very tough cake (as well as tough arms after nearly an hour of beating...). Take five pounds of fine Flour well dried and four pounds of single-refined Sugar beaten and sifted; mix the Sugar and Flour together, and sift them through a Hair-sieve; then wash four pounds of Butter in eight spoonfuls of Rose or Orange-flower water; you must work the butter with your Hand, till 'tis like Cream; beat twenty Eggs, half the whites, and put to them six spoonfuls of Sack; then put in your Flour a little at a time, keeping stirring with your Hand all the time; you must not begin mixing it till the Oven is almost hot; you must let it lie a little while before you put your cake into the Hoop; when you are ready to put it into the Oven, put into it eight ounces of candied Orange-peel sliced, and as much Citron, and a pound and half of Carraway-comfits; mix all well together, and put it in the Hoop, which must be prepared at bottom, and buttered, the oven must be quick: it will take two or three hours baking. You may ice it if you please." From The Compleat Housewife, Eliza Smith, 5th edition, printed in 1732 , p.132-3. Though the seeds change between recipes, caraway seeds seem to be the most popular choice. Conversely, caraway seeds aren't actually seeds - they're fruits that look similar to cumin and taste a bit like anise. Eliza's recipe appears to have a huge amount of seeds - a pound and a half to five pounds of flour - but I think that's because they're sugar coated comfits. Gervase's half an ounce to a pound of flour seems much more normal. Modern cakes are much smaller - depending on the weight of the pound (there were several systems at the time) five pounds of flour would weigh around two kilos, making an enormous cake - so you just need a pinch or two. I've tried making two styles of seed cake. They're quite different, both in taste and texture, but I liked the caraway in both. The first recipe I tried was Fergus Henderson's, which is a buttery, rich sponge that is vaguely like Eliza's. I found it impossible to stop the mixture curdling (even after trying every trick I could think of and adjusting the ingredients a few times) but it still rose well and tasted good. 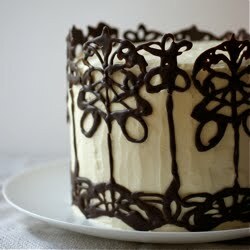 I've also spotted a similar-ish caraway seed cake in the beautiful Vegetable Literacy, though I haven't tried it yet. Finally, and as pictured, I tried adapting my family Old Fashioned Sponge Cake recipe by adding a big pinch of crushed caraway seeds to the mix and sprinkling another pinch of whole ones over the top along with a teaspoon of caster sugar. I made a three egg mix (so the flour is divided by 3 and multiplied by 1.6) and I didn't replace the self-raising with baking powder (as it doesn't really need the extra boost and it seemed more traditional that way). It took 35 minutes to bake instead of 40-45. This version bears more of a resemblance to Gervase Markham's recipe. I think it's a shame that people stopped adding seeds to cakes - up until the end of the nineteenth century they were in almost every non-fruited recipe, yet now they're a curiosity. It's worth trying a pinch in your favourite plain sponge - if only as a simple way to evoke the past. P.S. I'm very touched - and a little flabbergasted - at the response to the Four Years post. I'm going to work my way through the comments replying to each in the next two days. If you'd like to enter the draw for one of the four presents to celebrate Poires' forth birthday, then please click over here and leave a comment before the 9th. Thank you, once again.